We tested the usefulness of chlorophyll a fluorescence quenching analysis for the selection of maize parental inbred lines able to produce F1 hybrids with a high CO2 assimilation rate during growth at suboptimal temperature. Fifty inbred lines, grown at 15 °C, showed at 6 °C a broad genetic variability regarding the quantum yield of photosynthetic electron transport (ΦPS2). A decrease of ΦPS2 in sensitive lines was caused more by reduction of the efficiency of excitation energy capture by open photosystem 2 (PS2) reaction centres (Fv'/Fm') than by a drop in photochemical quenching (qP). Selected inbred lines with the highest (H) and the lowest (L) values of ΦPS2 were used for separate crossings in a diallelic arrangement. Twenty-one of H×H hybrids and 21 of the L×L hybrids were grown at 15 °C. 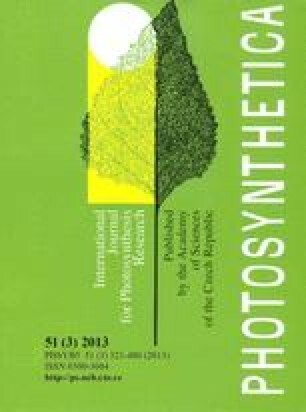 The H×H hybrids showed at suboptimal temperature a significantly higher transport of photosynthetic electrons than the L×L hybrids at lower (400) as well as at higher [800 μmol(photon) m−2 s−1] irradiance. The mean net photosynthetic rate (PN) in H×H and L×L hybrids amounted to 8.4 and 5.8 (second leaf) and 8.5 and 7.6 μmol(CO2) m−2 s−1 (third leaf), respectively. Among the best 20 hybrids with regard to PN (values larger than the average) of second leaves, as many as 15 were derived from H lines (75 % of hybrids), whereas among the best 21 hybrids with regard to PN of the third leaves, 16 were derived from H lines (76 % of hybrids). The intensive PN of H×H hybrids was most often accompanied by less water lost via transpiration in relation to photosynthesis than in the hybrids of L lines. Hence an analysis of chlorophyll a fluorescence quenching enables the selection of inbred lines, which can produce hybrids with improved CO2 fixation and with efficient water management during growth at suboptimal temperature.